This Mother's Day, say it with Black Gold! Many Asian old folks do not have sweet tooth and aren't really into cakes. 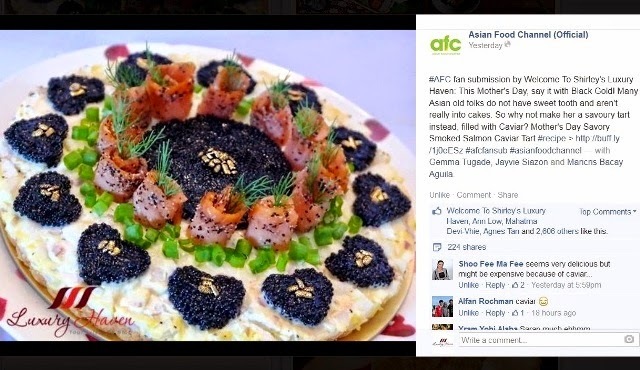 So why not make her a savoury tart instead, filled with #Caviar? 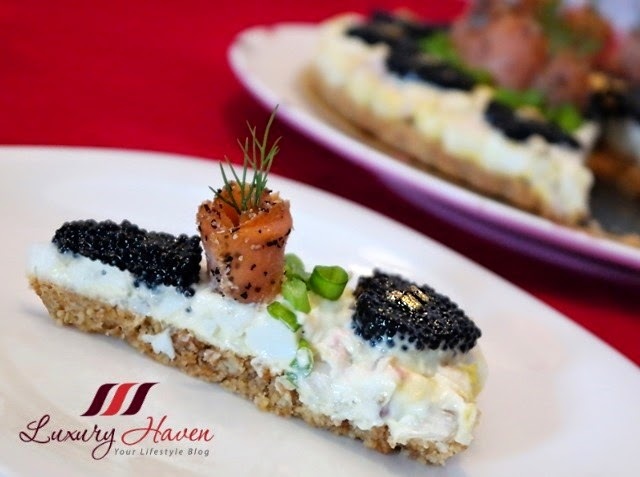 You must have known by now that my family is a huge fan of caviar with the handful of these black gems recipes in my blog. Mother's Day is fast approaching, so I started cracking my head thinking of what to make for my mom in advance. 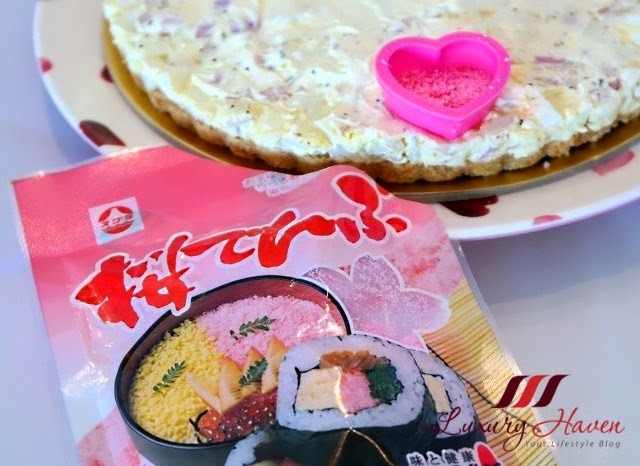 My initial idea was to make use of my leftover packet of Sakura Denbu (桜でんぶ), a popular type of fish flakes commonly found in Japanese cuisines. I thought my tart would look pretty with these pinky flakes, but my plan flopped miserably. I wanted to alternate the hearts between black caviar and the pink denbu. 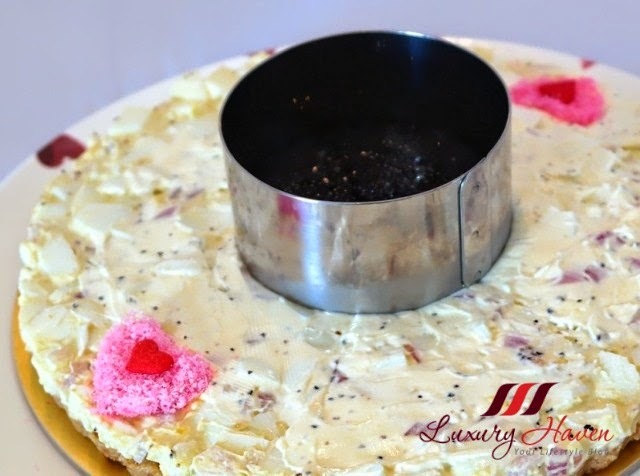 My appetizer looked rather attractive with the hearts that I'd formed using a mould. However, I noticed the denbu didn't hold too long and started to melt as I progressed (see the pink heart at the far end). Disappointed, I scrapped the idea and stuck to just one colour instead. Then I recalled having a bottle of gold "ornaments" bought from a baking shop just recently. 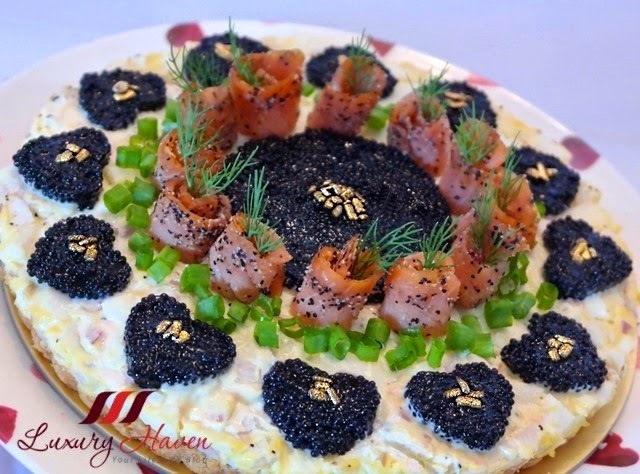 Thanks to these gold decors, my Caviar Tart stood out like an elegant grand dame! Gosh, I'm salivating even as I'm writing. The tart is soooooo good! My mom is not into caviar as much as we do, but the combination plus the biscuit crunch simply makes it irresistible. She loves it, and I certainly hope you will too! Shall we get started? 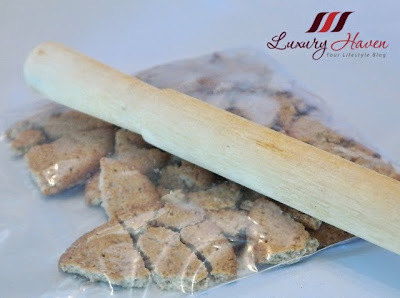 Using a roller pin, smashed the biscuits in a sealed plastic bag. 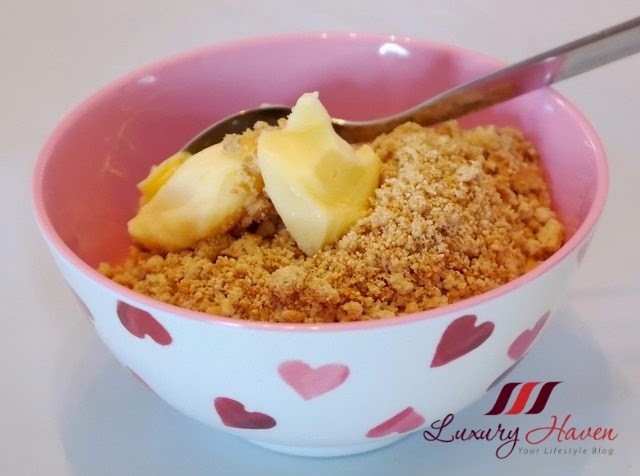 Mix butter with biscuit crumbs. 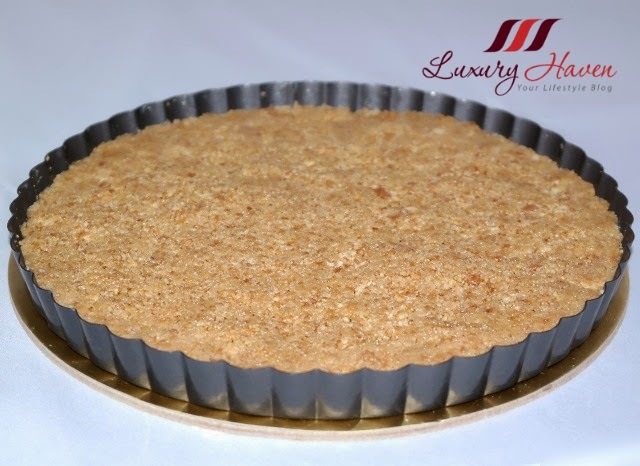 Grease tray with butter and lined with biscuits to form the tart base. Pressed it down firmly with the back of a spoon. Refrigerate for about an hour. 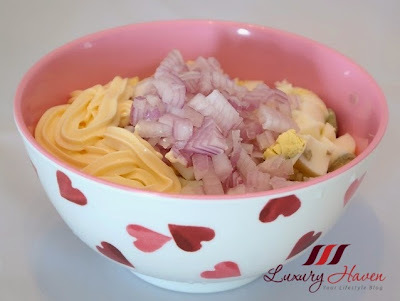 Mash the eggs and mix with onion and mayo. Fill the base of the tart with egg mixture. 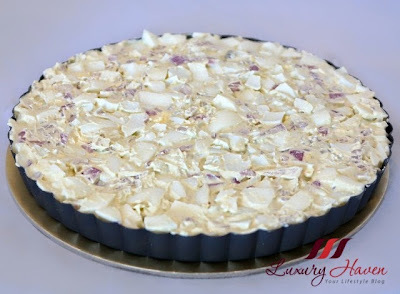 Remove tart from tray and put on a cake board. 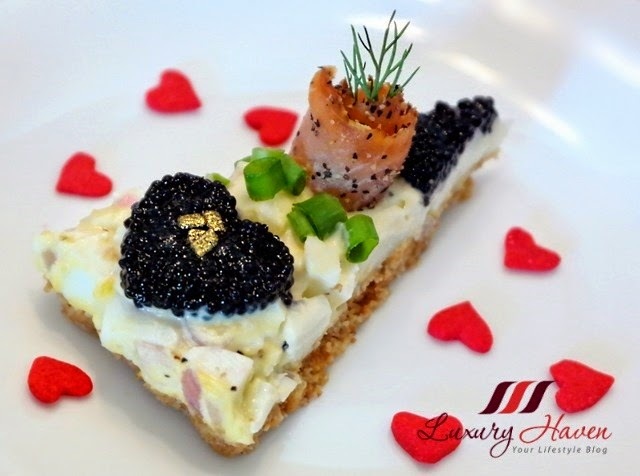 Start decorating your tart with caviar using moulds. Roll the smoked salmon and add onto tart. Garnish with dill. 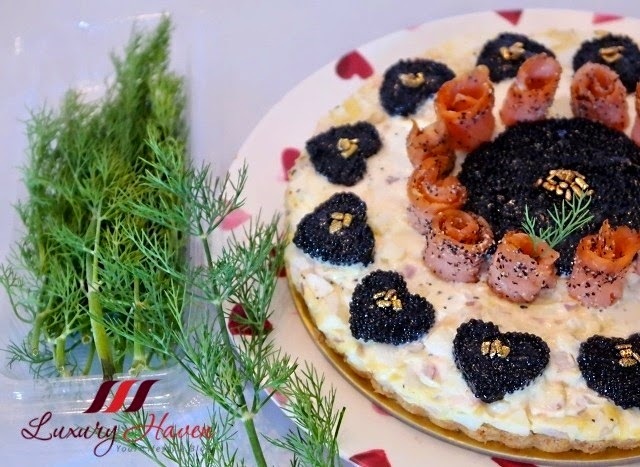 Sprinkle spring onions on the tart, embellish with the gold ornaments and you'll get a beautiful Savory Smoked Salmon Caviar Tart for Mother's Day! Refrigerate your tart and cut them up just before serving. 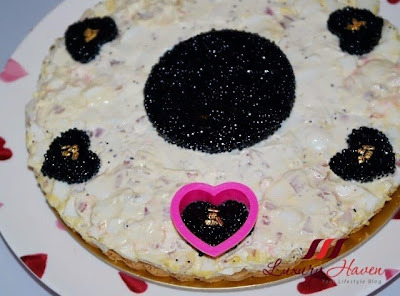 Tips: To preserve the freshness of the caviar tart, cover with plastic wrap and refrigerate in between your decoration if you're taking too long. Did you say Caviar is too expensive? Say it with DIY Flowers instead this Mother's Day! 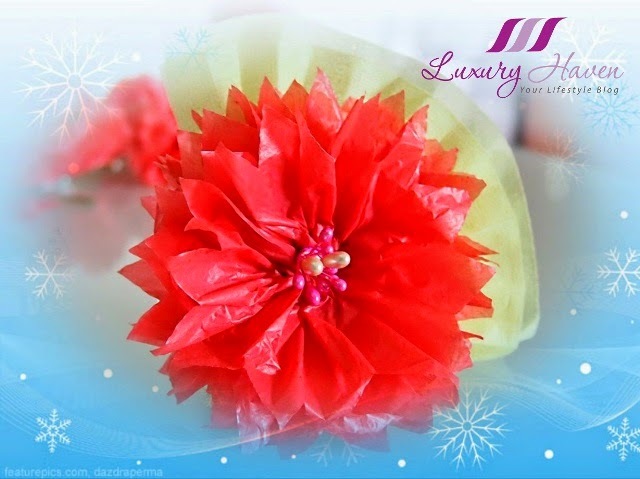 Go green, use those plastics bags you get from the market to make these beautiful flowers for your mom on that special day. Like the idea? Share it with your friends and get them started too! Check out the photo tutorial by my 85-year-old mom! HAPPY MOTHER'S DAY, my beloved friends and readers! Beautiful tart! and definitely delicious too. Must be expensive, with caviar, but its for mother's day so why not ? Rajiv, definitely worth the splurge on such a special occasion! Thanks & have a good weekend! Sharon, knew this would catch your attention! Thanks, sweetie! Your big tart is so beautiful like a Garden of Eden. Adam & Eve would have enjoyed running in circles~! If I made this for my momma, she would cry with joy! The whole total is not cheap for appetizer but your love is priceless. 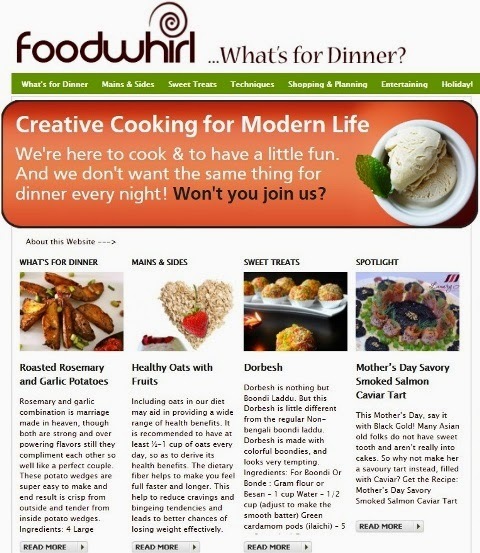 Delicious and great idea looks beautiful and appertizing. Nice job. Jackie, thanks sweetie! Have a great weekend! Gosh!!! Looks so heavenly. 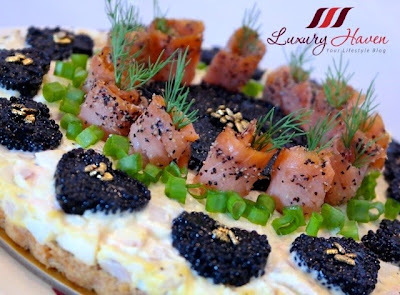 I'm not a big fan of caviar but I love the outcome. Nava, I remember you mentioned that some time ago. Hope I can tempt you with my wacky version. Hahaha! Ken, thanks so much for your lovely comment! I'm glad you like this one too! An absolutely stunning tart!! Loved going through the pictures...which mom won't love this?! i love how you're so creative with the food things! Andrea, thanks sweetie! Enjoy your weekend! Diana, that's very sweet of you! Happy shopping, sweetie! Absolutely beautiful Shirley! Simple and yet so eye catching and appetizing! A few simple molds can help so much too! Sharlynn, absolutely easy to make! Cutting moulds are must-have in the kitchen. Heehee! This is super yummy treat. Lovely and creative. I am salivating over your caviar. I love caviar too. Happy Mother's Day to you and all moms out there! Rose, great having another fan of caviar here! 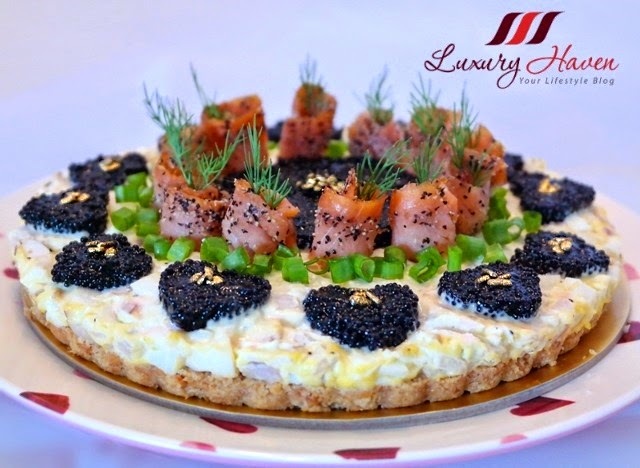 Let's tuck in to the caviar tart!! You are indeed so creative and innovative. Who will ever thought of using smoked salmon and caviar to make such a beautiful and lovely tart? SD, thanks & have a good week! Lina, come & take a bite! Hahaha! Just groaned at an awesome food pic! This is really beautiful and work of art with simple ingredients. I am going to try this. What a spectacular tart! I'm sure you mother loved it...as would I. Happy Mother's Day to you both! Liz, thanks & Happy Mother's Day to you too! Mouthwatering, you are so talented. Rainbow, thanks so much for coming by! Love having you around :) Gonna pop by your blog as soon as I get the time. Wow..such a luxury dish for Mother's Day celebration. Looking divine and up to the fine dining restaurat quality! Good job Shirley. Yee Ling, definitely worth the effort seeing the smile on mom's face. Thanks, sweetie! That's both gorgeous and creative! Monica, thanks! Have a wonderful Mother's Day celebration! Trishie, I'm really satisfied with this new creation too! Hahaha! Thanks, sweetie!